...then follow these seven quick tips to prepare well and get ready for performance review. You have been collecting data about your performance throughout the year, working on your career development plan , written your performance review and given it to your boss, and now it is almost time to have the actual discussion. 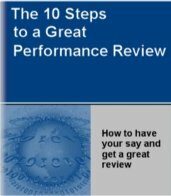 How do you get ready for performance review and prepare yourself? Here are seven quick tips that will help you prepare more effectively. Think positively - a good way to get ready for performance review is to put yourself in a positive frame of mind. Don't think negatively if you did not have a great year or expecting a mediocre review. This will not help you. If this is the situation then you can't do much about the past. But you can control the future by making a choice about how you want to receive the information, whether good or bad and what you do with it. Starting positively will also help you breeze through the next six steps and get the most out of them. Focus on the outcomes - do revisit the very first step of this process so you can refresh your memory about what you want to get out as you get ready for performance review. Are you after the best rating, a salary increase, great feedback that will help you maximize your career potential or a combination of all of these? Think about it and write it down. Then go through each of them and prepare your discussion points, issues and questions. Prepare to back up your points - a good place to start your preparation is with your portion of the review. If you have already written and submitted it to your boss then go through each point, particularly the claims about your achievements during the year. Get ready for performance review by preparing notes on each statement with facts and figures and back it up in your mind. If what you have written could be questioned then you need to prepare even better by thinking about what you will say if it comes up during the discussion. Anticipate issues and concerns - that may be raised and think of what you want to say, and ways you can overcome those concerns in a positive manner. Even if you are expecting a good review and the discussion to go smoothly think about one or two areas that your boss may raise and what you will say if they come up. Rather than get into a heated argument it is best to think about how you will handle it. If it is something that you could have done better or differently then be prepared to accept the feedback and then work with your boss on a plan to improve it. If you feel very strongly about it then think of a way you can state your point but in a positive manner. Always leave a way out for yourself from a difficult discussion. Reflect on your competency gaps - and have some ideas around how you will close them. Preparing well should include some time spent thinking about your skill andcompetency gaps and some general ideas around how you can close those gaps. All of us have gaps and can do better over time. What are yours? Is there an area of your work you are having difficulty with? Is it related to knowledge, experience, leadership skills or some combination of all three? Get ready for your performance review by reflecting on the answers to these questions and think about how you will close them. Having this ready in your mind will not only make for a better quality performance review but also indicate to your manager that you are serious about your career. Prepare questions in advance - you can have a better discussion by preparing some questions in advance of your performance review. In fact, this is a great time to clarify your career goals and objectives , skill and competency gaps and career development techniques linked to your employee development plan. Write your questions , take them with you during the discussion and engage your manager in a good discussion. I can guarantee you that you will have a much better review if you do this as you get ready for your performance review. Be prepared to give feedback - good managers ask for and expect feedback. Get ready for performance review by thinking about what you will say when your manager solicits your feedback. It is easy to focus on just one or two bad incidents and give feedback which is not all positive. Instead, look at the whole year and think about your job, your interaction with your manager and what that did for you and your performance. A good method I use is to think about what the other person should: 1) continue doing or do more of; and 2) stop doing or do less of. One or two points under each is sufficient and gives you a good and balanced framework to work with. Previous - what to do before you submit your review.